Voted Delaware’s Best New Restaurant! For the Latest Grain H2O happenings, check us out on Facebook! 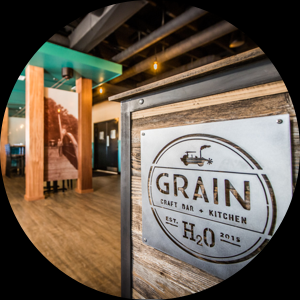 Grain H2O takes all the fun food, drink and atmosphere of Grain and puts it on the water. Indoor and Outdoor bars, live music and a big covered patio make Grain a great escape. Featuring award winning food creations, you will always find something to satisfy your appetite. Located in the newly renovated Summit North Marina on the C and D Canal, you can reach us by car, boat or even bike up along the Mike Castle Bike trail. Getting here is easy, leaving is much harder. With twenty craft taps and over fifty in the fridge, there's no shortage of beers to choose from. Our unique "Beer Bible” allows you to safely explore all edges of your taste buds. Behind our two bars are bartenders who know their way around the famous crush machine, can blend a frozen creation or suggest one of our many wines. We do not take reservations. (Except for Easter and Mother's Day.) For parties of 6 or more, we request that at least 6 people be present before seating. Feel free to call ahead to gauge the wait and let us know that you are coming. For parties over 20, please fill out the form on the Private Parties@Grain tab.